US President Donald Trump suggested arming teachers to deter future mass shootings. 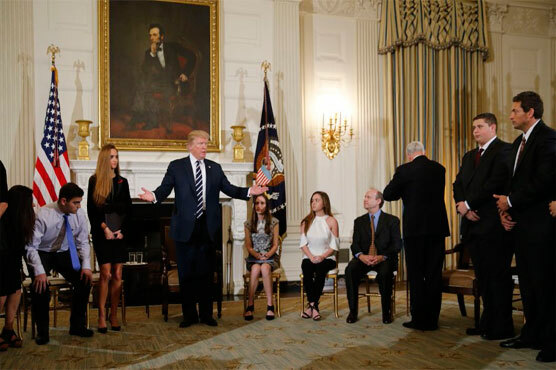 WASHINGTON (AFP) – US President Donald Trump suggested arming teachers to deter future mass shootings as he held an emotional meeting Wednesday at the White House with survivors of the gun rampage that left 17 people dead at a Florida high school. Trump also promised “very strong” background checks on gun owners during the poignant “listening session,” in which he heard first-hand accounts from bereaved parents and friends, and schoolchildren who narrowly escaped with their own lives. “A gun-free zone, to a maniac — because they are all cowards — a gun-free zone is Let s go in and let s attack,” Trump said. “If you had a teacher who was adept at firearms, they could very well end the attack very quickly,” Trump said, suggesting that 20 percent of a school s teachers could be trained to carry concealed weapons. “This would only be obviously for people who are very adept at handling a gun,” Trump added. The televised White House meeting came as students staged street protests across the country to demand stricter gun laws following the murder of 14 teens and three teachers at Marjory Stoneman Douglas High School in Parkland, Florida. Holding signs reading “Never Again” and “Be The Adults, Do Something,” teenaged survivors of last Wednesday s shooting rallied outside the Florida state Capitol in Tallahassee. “No longer can I walk the halls I walked millions of times before without fear and sadness,” Stoneman Douglas student Florence Yared told a crowd that included thousands of supporters. The White House meeting was attended by Stoneman Douglas students, their parents and also the parents of victims of the Columbine, Sandy Hook and other shootings. Andrew Pollack, whose 18-year-old daughter Meadow was among the Stoneman Douglas victims, told Trump it was far too easy for people such as the 19-year-old shooter gunman Nikolas Cruz to acquire weapons. “I m here because my daughter has no voice. She was murdered last week and she was taken from us, shot nine times,” he said. “We as a country failed our children. This shouldn t happen. Justin Gruber, a 15-year-old Stoneman Douglas student, said “there needs to be significant change in this country because this has to never happen again. “People should be able to feel that when they go to school they can be safe,” Gruber said. Urgent calls for action following the 2012 Sandy Hook massacre, which left 20 children and six teachers dead, had failed to break the national deadlock on gun control. But students have vowed to make the Parkland tragedy a turning point, with youths inspired on social media by the activism of their peers staging walkouts from high schools in Florida and elsewhere on Wednesday. Hundreds of students descended on city hall in Minneapolis, Minnesota, and marched in other cities, including Chicago, the Midwestern metropolis racked by gun violence. In Washington, hundreds more gathered outside the White House chanting slogans against the National Rifle Association (NRA), the powerful gun lobby, and demanding action from Trump. “Hey hey, ho ho, the NRA has got to go,” they chanted. Students are planning a march on Washington on March 24, with sister rallies planned across the country. Trump — who received strong backing from the NRA during his White House run — has shown a new-found willingness to take at least some steps on gun control following the Parkland shooting. The president threw his support Tuesday behind moves to ban “bump stocks” — an accessory that allows a semi-automatic rifle to be fired nearly as fast as an automatic weapon. But his suggestion of arming teachers drew immediate scorn from the founder of the advocacy group, Moms Demand Action for Gun Sense in America. “I m honestly gobsmacked that the President just used a forum with gun violence survivors to pimp the @NRA s priority legislation and to suggest arming teachers,” tweeted Shannon Watts. The idea of countering school shootings with additional weapons is already being put in place in Broward County, where Stoneman Douglas is located. The US Congress has long been deadlocked on the gun debate, accomplishing nothing despite a spate of mass shootings and polls showing that Americans support stricter gun laws by a two-to-one margin.